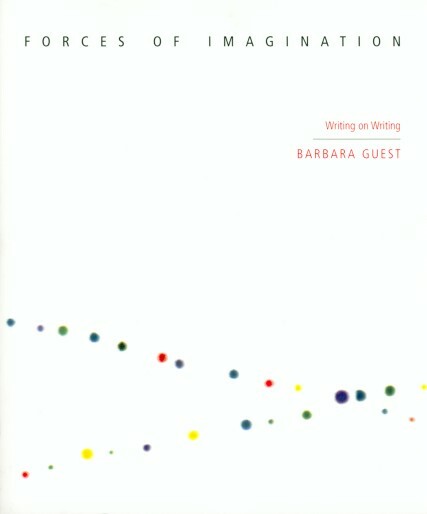 Writing on Writing, by Barbara Guest. Cover and interior images by Laurie Reid. We expect poets to give a first-hand account of what poetry is. But some poets, when they write criticism, produce a kind of prose that is itself on the verge of being poetry. Valéry, Stevens and Marianne Moore belong to this "visionary company." And so does Barbara Guest, whose writings on poetry, collected here, are among the most inspiring works of their kind. It is a deep pleasure to know that such writing can still exist. In this companion to her important poetry, Barbara Guest may be said to advance a poetics amazed in its dreaminess and lyrical in its critical register. No wonder the Symbolist poetics from which she takes her core meaning is as integral to her poetry as it is: it is the way she thinks! Her aphoristic plasticity is affirmative, affirmative in performing imaginative acts on our behalf. Guest has earned her formidable reputation through dedication to modern lyric's difficult double-project of making song think and making thought sing, of stretching the very medium of conceptual thought — language — all the way toward music and affect, but without relinquishing any of the rigor of conceptual intellection. The essays, talks and addresses, and prose and verse meditations now gathered in Forces of Imagination offer welcome points of entry into Guest's challenging aesthetic. Writing about thinkers, poets and writers as diverse as Baudelaire, Mallarmé, Plato, Walter Benjamin, Kant, Pasternak, Machado de Assis, H.D., Horace, Wallace Stevens and Pound; about radical and conservative poetics, modernism, postmodernism, the relationship between art and poetry; about the importance of imagination and surprise in poetry, Barbara Guest situates herself in a multi-faceted literary landscape spanning centuries and continents, at the same time providing brilliant insights into the roots and workings of contemporary poetry. This is an evocative collection of essays and poems on writing that might be quite provocative to a certain audience steeped in the poetics of academia. Fascinating reading for anyone interested in the possibilities of modern writing.